Heimlich, 64, has never come back to politics since that bruising and brutally expensive 2006 loss to Democrat David Pepper in the commissioner's race. Heimlich has no plans to come back, but the Republican still loves to talk politics. Last fall, he resurrected his "Hard Truths" podcast on iTunes and philheimlich.com. It's where you can get your fill of Phil. ...Politics Extra isn't sure anyone's listening yet, but Heimlich is hoping to gain a national following. Please lend an ear to the following audio clip from Phil's February 28 podcast. 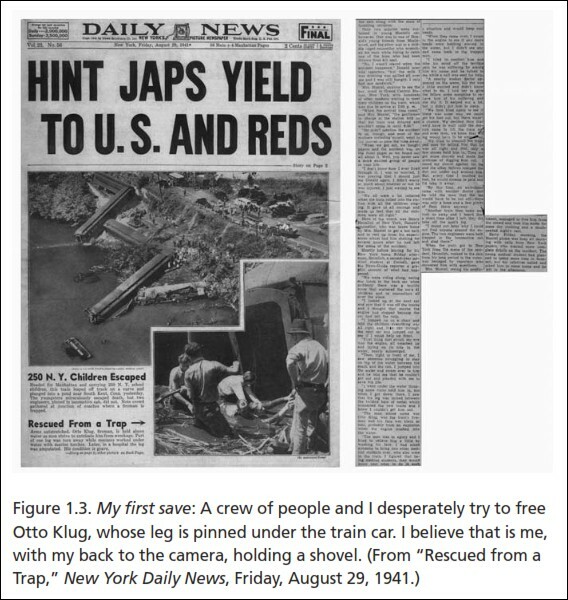 Based on articles in the New York Times and New York Daily News, both dated August 29, 1941, Phil (and his engineer/announcer Rob Reider) give big ups to our dad for having saved the life of a man in a dramatic high-profile train wreck the previous day. What makes this interesting -- and a little spooky -- is that the same day the podcast aired, the newsletter of Connecticut's Kent Historical Society (KHS) published Who Saved Otto Klug? Investigating a 75-year-old mystery, my article about the train wreck. And that was my first problem with the train wreck story – over the decades he never mentioned it to me. I only learned about it in the early months of our research when (my wife Karen Shulman) and I happened upon the 1941 New York Times articles. Instead, they near-unanimously identified a local resident named Jack Bartovic as the person responsible for holding Klug’s head above water for hours. 1) I'd be curious to know your thoughts about the contradictory claims I reported and in the articles posted on this web page I made: http://medfraud.info/OttoKlug.html Please feel free to elaborate. 2) Per my article, Henry never told Karen or me about the train wreck and no one else in the family (including you) ever mentioned it. 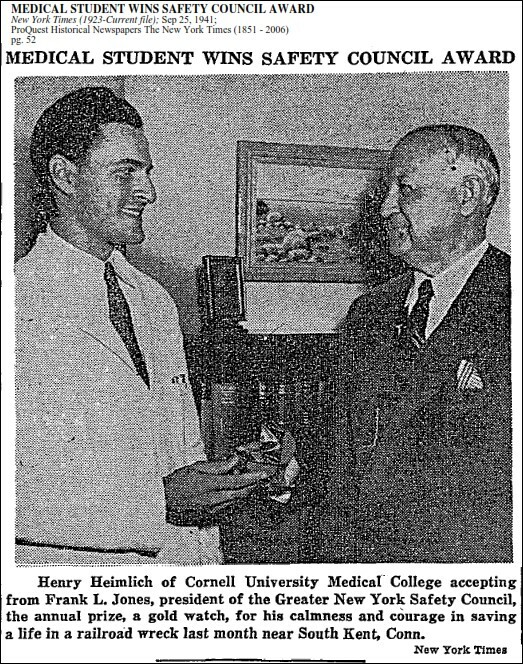 We only learned about it in the early months of our research into Henry's career when we happened upon the two 1941 New York Times articles. Approximately when did you first become aware of the train wreck story and how did you hear about it? 3) In your podcast you read from the August 29, 1941 New York Daily News article about the wreck. I'd seen that article pasted-up in Henry's 2014 memoir [see below] but the text is too small to read. I haven't yet been able to obtain a copy of the article, so I was pleased to learn you've got one. Would you please send me a copy so I can check it out and add it to my web page? I got a confirmation of receipt but no further communications. I was especially interested in his answer to my second question. That is, when did Phil first become aware of the train wreck story? Did dad keep him in the dark, too? Here's a video clip of Phil relating the train wreck story while introducing dad at a January 27, 2015 event hosted by the Cincinnati Business Courier. (He was receiving the newspaper's Health Care Hero award, an honor reportedly arranged by his longtime attorney, Joe Dehner). The way Phil tells it, it sounds like the first time he heard about the train wreck may have been eight months earlier when he came across the New York Times in the course of helping our parents move. So I e-mailed the video clip from the awards event to Phil and asked if that was accurate. Again I received his confirmation of receipt, but no further communications. Per Karen's letter to the editor in the April 2006 Cincinnati Magazine: "That's Phil -- a profile in courage." Apparently I'm on my brother's do-not-respond list, so if anyone asks Mr. Hard Truths about this, I'm curious to know how he responds. Click here for my contact info. Via my father's 2014 memoir, Heimlich's Maneuvers.